Samuel Chotzinoff was born in Vitebsk, Russia, on July 4, 1899. His father was a rabbi and teacher of Yiddish. The family emigrated to the United States in 1906. At ten, Samuel exhibited decided musical predilectiones, and began taking piano lessons under Jeanne Franko (sister of the noted Franko brothers), and later under Oscar Skach, at the Columbia University in New York. Chotzinoff also studied theory and composition at the same institution under Daniel Gregory Mason. He also pursued a general academic course at this University. Chotzinoff came to the fore as an able accompanist, when in 1911 he made a concert tour with Zimbalist. In the following years he was accompanying artist to Zimbalist's wife, Alma Gluck, and also to Frieda Hempel. 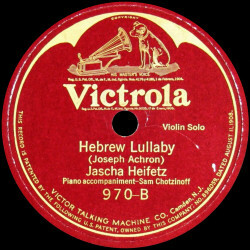 He reached the peak of his career as accompanist when in 1919, he undertook a tour with celebretad violinist Jascha Heifetz, whose sister Pauline he subsequently married in 1925. Chotzinoff's early musical articles began to appear in 'Vanity Fair' and other American magazines in 1923, and on the resignation of Deems Taylor he became music editor of the 'New York World', one of the most important of the metropolitan dailies. In 1936 Chotzinoff became NBC director of musical department, and in 1951 he became producer of NBC's TV operas. 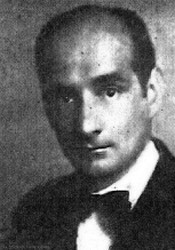 Samuel Chotzinoff died at 9 February 1964, in New York.